Juan Santos attacked Hernandez early, stunning the Hawthorn, CA, native 15-10 to take the first set. Having the heart of a champion, Hernandez fights back in game two with very well placed and planned out shots and eventually downed Santos 15-9 to set up a fifteen point game to determine the world title and player’s cup trophy. Hernandez found himself down early but fought back to tie the set at five; where both players traded back and forth drama all the way to 12 with six lead changes along the way. Hernandez makes the first error giving Santos the 13-12 and eventually 14-12 lead before Samzon forced a side out; trailing 13-14. A 23 shot rally ensued with Santos and Hernandez doing multiple side-to-side shots before Santos sends a cutter out the left door (that appeared to be headed toward the side wall) before escaping the show court to a mob of spectators and fans; who rushed the court to hoist the champion in the air. 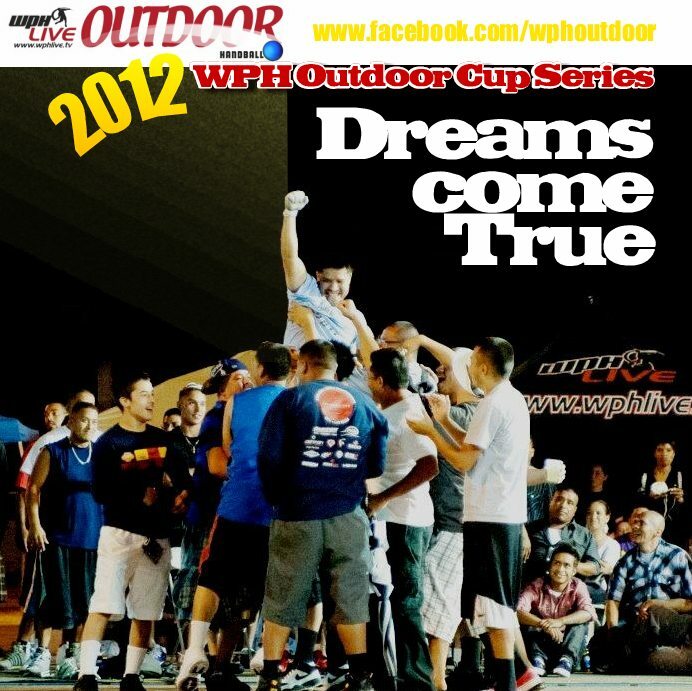 For Santos, he takes the trophy and the title as the number one player in outdoor 3 wall big ball action. The videos from this past weekend will be uploaded to the on demand page shortly. Members of Enet will be alerted after all matches are available. In the Men’s open singles, Luis Moreno steamrolled last year’s champ, Shorty Ruiz, 15-3, 15-5. “Moreno is a beast. I have not seen serving like this ever. Paul Brady watch out,” says one crazed handball fan. For Moreno he slammed the small ball pro divisions, as he also took down the yellow jersey with his doubles win (Dave Vincent) against Luis and Danny Cordova a night earlier. In that match, Moreno took over in the tie-breaker and lead the charge after being down three to nine before an 8-0 run that featured key serving and incredible gets by the Tucson, AZ, resident. In the women’s big ball pro division, Sandy Ng was denied a jersey, as Tanisha Groomes wins her third straight stop and overtakes Ashley Moler in the pro rankings. Ng wasn’t denied another attempt at the yellow jersey when she and current 3 wall champ, Tracy Davis, edged out Ashley Moler/Melissa Sky to win the women’s pro big ball 3 wall bracket. And, in the attempt of some sort of balance, Ashley Moler wasn’t denied a yellow jersey when she and Raul Calvillo won the pro mixed doubles versus Groomes and Kevin Gonzales. The men’s pro big ball doubles had hundreds of fans on site late Saturday when Samzon Hernandez and Eddie Jocol stunned Manny Fernandez and partner Tony Vasquez to take the yellow; (15-10), 15-11, 15-12. “This was one of the most entertaining matches I have ever witnessed,” barked one screaming on-looker. The WPH agrees! WPH thanks Mike Coulter with 3WB, Hank Marcus (WOR/Ektelon), Ektelon, Scott Winters, Mintec, Stratosphere Hotel & Casino and donors, sponsors and volunteers for their amazing support. Big congrats to Steve Soto and Ashley Moler for running a pro style tourney desk all weekend (putting in 18 hour days for the love of the game). Special thanks to Jennifer Hinman, Vic Espinosa, Luis Estrella, Richie Estrella, Abe Montijo, Angel Estrella, Ray Ortiz and Ivan Lugo for long hours of volunteer work and amazing support. Once again great work by the WPH film team: Linda Manning, Kris Gurrad, Ben Gurrad and Issy Rivera.